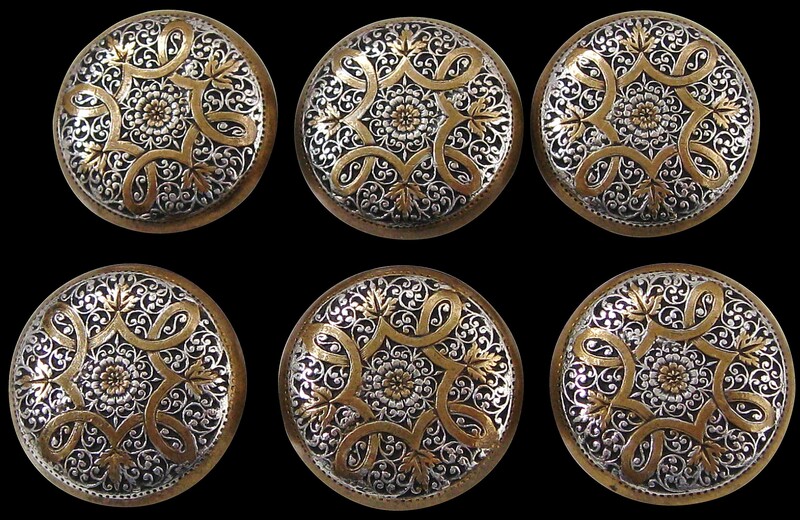 This set of six buttons shows an extraordinary level of craftsmanship. The face of each button comprises a central lotus flower with inner petals of brass and outer petals carefully rendered in silver surrounded by an elaborate square, the points of which terminate in a chinar or plane tree leaf, all amid swirling tendrils finely executed in silver against a darkened background. These buttons almost certainly come from a courtly costume. Chinar leaves are frequently seen in examples of Kashmiri silverwork. Plane trees were introduced to Kashmir by the Mughals which stand today in magnificent groves throughout the region. The fineness of the work and the use of lotus and chinar motifs suggest Kashmiri origins.